The adventure begins with a tour of Cape Town's famous townships. We head north across the Western Cape to Namibia. En route we take in the Cederberg Mountains and the Orange River. The spectacular Fish River canyon and the spetacular landscapes of the Namib Desert are a couple of the highlights of the tour. We have time to partake in some of the activities offered in Swakopmund - the adventure capital of the desert, before heading for Etosha National Park. En route we visit Spitzkoppe with its bushman rock paintings and have time to explore this lunar landscape. 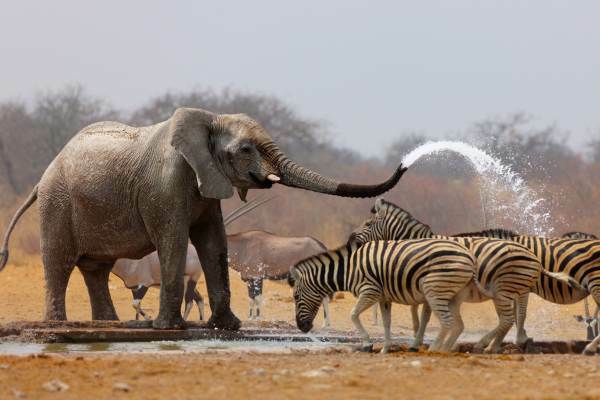 Etosha National Park, Namibia's largest game reserve, offers some of the best wildlife viewing in Southern Africa. Spend time at Etosha's famous waterholes and best have your camera ready. Traveling south, our safari tour ends in Windhoek - the capital of Namibia. The journey begins in Cape Town with a visit to the townships on the “Cape Flats”, where we get an insight into the local culture and lifestyle. Leaving Cape Town behind, we head north to set up camp near the Cederberg Mountains. In the afternoon we have a chance to sample the local wines, relax and to meet our fellow travelers. Tonight we set up camp on the banks of the Orange River (South Africa side) - also known as the Gariep River by locals (River of Hope). The Orange River flows through the Richtersveld, a unique area of South Africa. The afternoon is time to relax. There is an opportunity to do a canoe trip, hike up a mountain or just chill at the camp and take a swim in the river. The evening is spent around the camp fire. This morning we have time for further exploring before crossing the border into Namibia. We head to the Fish River canyon with its spectacular scenery. The Fish River Canyon is known to be the world’s second largest and provides amazing vistas. Excellent phootgraphic opportunities. 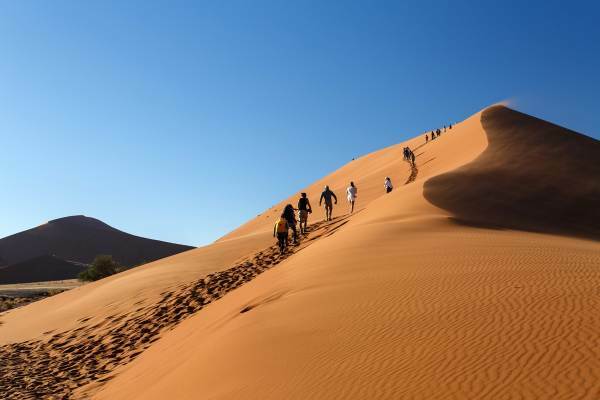 The Namib Desert is definitely a highlight of any Namibia tour and a popular destination. Today we head to the Sesriem area, bordering on the Namib Naukluft National Park where we set up camp in this immense desert and spend the evening under the desert stars. The Namib desert is the oldest desert in the world and also boasts the highest sand dunes. Wake up to a spectacular sunrise over the desert. We head to Dune 45 where we have an opportunity to climb this huge dune– not as easy as it sounds. A photographer’s dream as the shifting shade and colour provide incredible beauty and contrasts. The “Dead Vlei” (pan) is in the heart of the desert and the old dried out trees backed by dunes offer an airy landscape. Next we visit the Sesriem Canyon to gain some interesting insight into the local geographical formations. This evening we set up camp in the quaint desert town of Solitaire. Swakopmund – the adventure capital of Namibia. We spend the next two nights in backpacker accommodation. The town (second biggest in Namibia) offers all the modern facilities and is a welcome break from the heat of the desert. Take time out to relax, enjoy the local cuisine, take a dip in the ocean, or partake in one of the numerous activities available. Quad biking in the desert and skydiving are popular activities and recommended. Leaving Swakopmund, we head to the Spitzkoppe – with its massive boulders and ancient Bushman rock paintings. We spend the afternoon exploring and there is a chance to do some rock climbing for the more active. Once again, the shadows and changing light offer fantastic photographic opportunities. An Etosha safari is another one of the draw cards of Namibia and offers excellent wildlife viewing – elephant, rhino, leopard, lion and hyena are just some of the animals that are regularly seen in the reserve. The next couple of days are spent doing game drives around the park. The guides are familiar with all the popular waterholes and time is spent watching an array of animals coming down to drink. We also visit the huge salt pan which Etosha is famous for. We spend the next two nights camp at one of the official campsites which boast flood lit waterhole and one can spend the evening watching the wildlife. This is definitely one of the highlights of any Etosha safari. A short game drive as we head to Windhoek, the capital of Namibia, where our overland adventure comes to an end. We say goodbye to our fellow travellers and head off with fond memories of this extraordinary country. 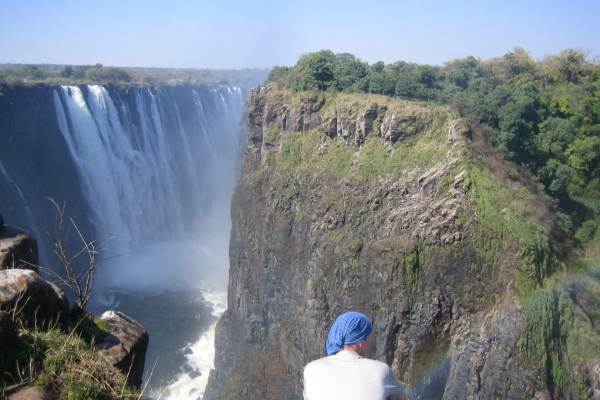 Safari Activity Pass - US$ 70 This is payable on departure and covers certain activities.